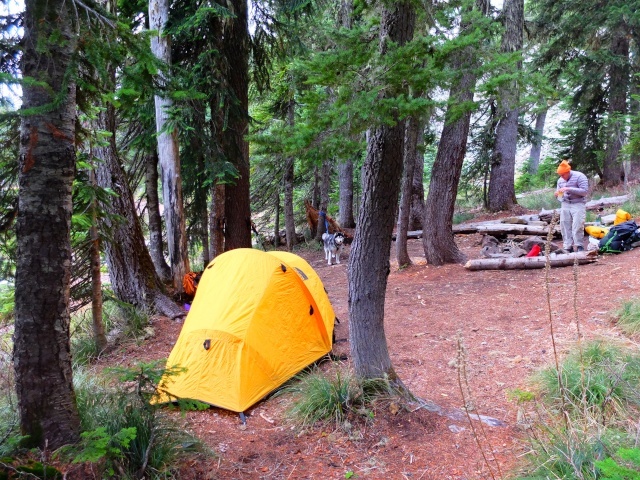 A friend and I had been planning a hike to Indian Heaven for several weeks, but schedules and rain kept interfering. Last week we found a window right before a big storm hit. Indian Heaven Wilderness is on the south side of Mt. 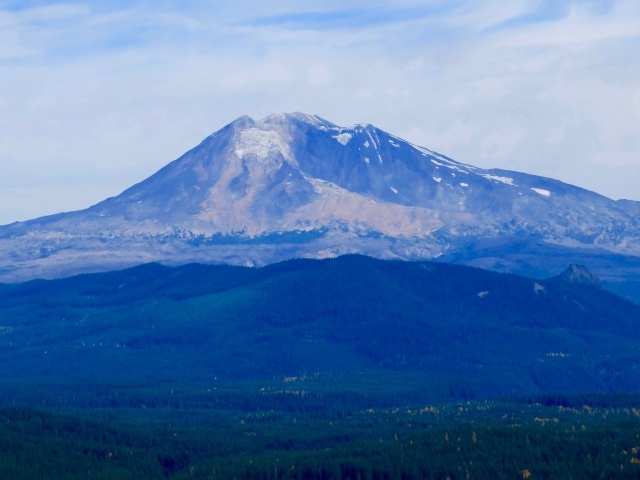 Adams and known for the ferocity of its mosquitoes in the summer. At this time of year, the bugs were gone. It is elk season, so we needed to wear blaze orange. 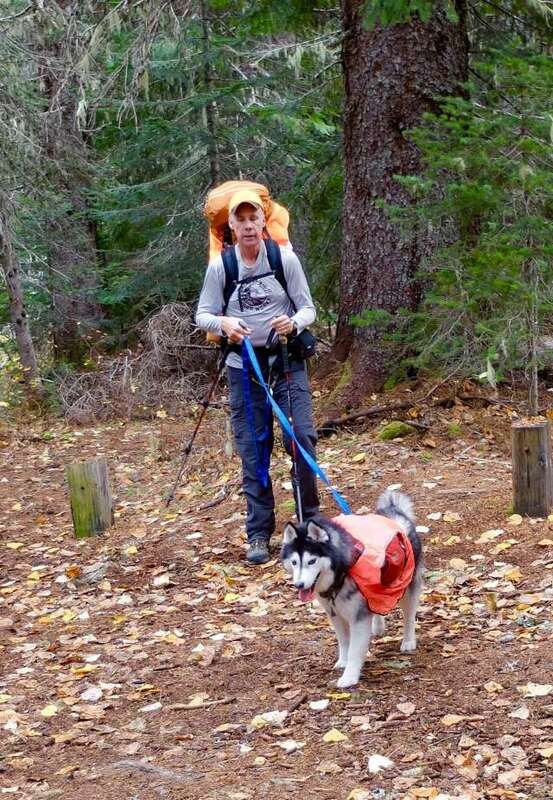 Bodhi wore a safety vest over his pack at the start. It lasted about half a day before he completely shredded it 4wheeling through brush. 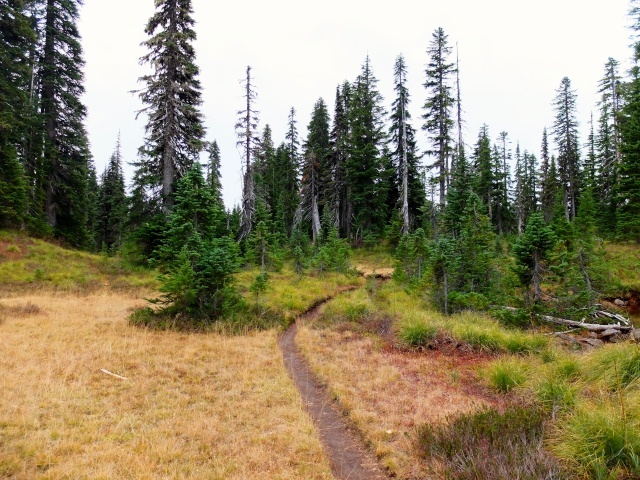 The trail climbed about 1200 ft. through douglas and sub alpine fir to a plateau of meadows and alpine lakes. At a break in the trees as we reached the plateau, we had our only view of Mt. Adams. The lack of snow and diminished glaciers are scary as is the prospect of another winter like last one. Glaciers are our water bank for the summer. Four miles in, we set up camp along Clear Lake. The water level was so diminished that it was difficult to reach water to pump as mud stretched long way out. That night was cold, but my sleeping bag was warm. We started a campfire and drank some potent spirits. Bodhi curled up next to me in the tent. The next morning, the sky was closed over. We made breakfast and packed up for a day hike around the perimeter of the wilderness. The forest was silent and gloomy. By this time, Bodhi had shredded his safety vest. But there were no alpine views and very little water running. 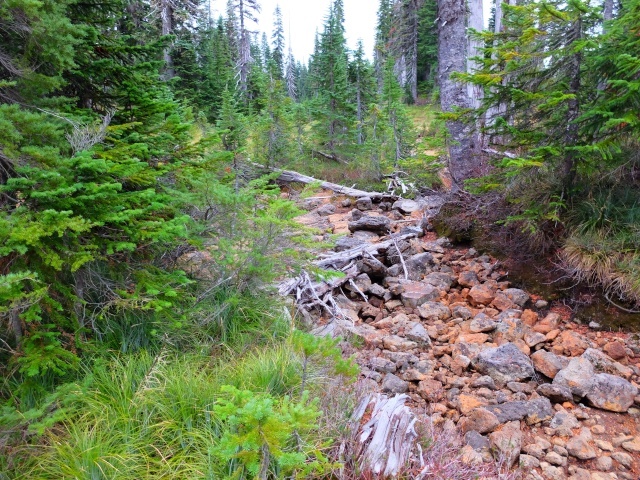 The stream beds were empty. We heard no birds and saw no wildlife. 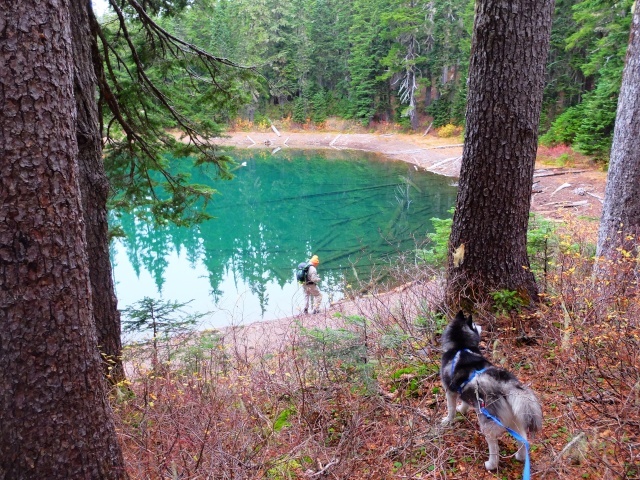 The whole wilderness felt like it was awaiting winter, awaiting snow. After our four hour walk around the edge of the wilderness, we arrived back in camp and had lunch. At one point, a group of horseback riders wearing blaze orange passed by. Feeling less than inspired by the gloomy, silent forest, we packed up and walked down to the car. The only hunters we saw were in Trout Lake when we stopped at the Bear Creek Cafe for huckleberry milk shakes. Bodhi was a great hiker. This was his first overnight of 2015. It’s been too hot for him before now. I learned how to prevent him from “exploring” as we walked along the trail. As long as Bodhi walked second in line, he would keep following. 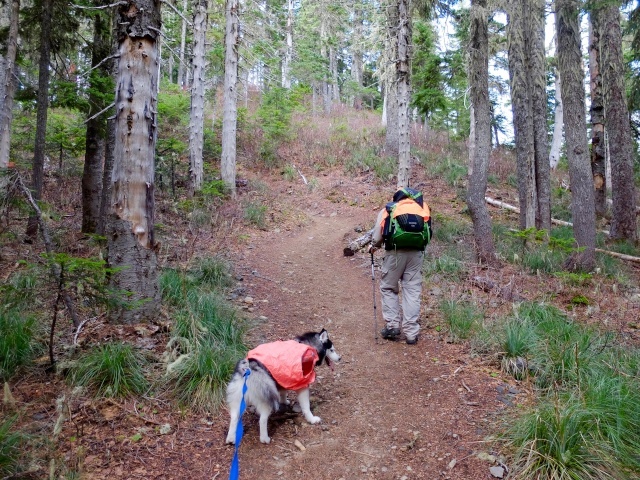 When he led, he would often wander off trail to sniff, tangling his lead. Yesterday, I hung up my tent and sleeping bag, cleaned my equipment and packed it away until next year. Great pics and vid Micheal too bad no widlife to see but i bet it was a great bonding experience. Something I've always wanted to do with my pups. I can't wait to start such amazing adventures with Cora, the photographs are beautiful! Looks really fun! Micheal, such great pics, and what a wonderful place to take handsome Bodhi. Did y'all get some much deserved rain? I know it has been real bad up your way, as far as lack of rain and snow. Thank you for sharing such a beautiful place. The skies opened on Sunday. Not like what you have been getting in Texas, but it's a start. Now for some cold and snow!